2013 competition entrant, Nickey Mannya, Managing Director of Rural Brands, shares some information and insight about his entrepreneurial journey and discusses why he decided to enter the competition. Briefly describe your business and the industry you operate in? At Rural Brands we develop and produce technologically advanced online solutions to help businesses achieve “efficiency through technology”. We operate in the information and communication technologies (ICT) sector. Rural Brands develop Enterprise Content Management (ECM) Systems, which organise and store a company’s documents and other content related to company processes. These systems are used on company websites and intranets. We also develop an Enterprise Resource Planning (ERP) tool named DDAY. This tool allows both internal and external audiences to share information, and is often used by finance and sales departments. We pride ourselves in that our products are home-grown and developed in-house. Where did your business concept originate from and when did you start your business? 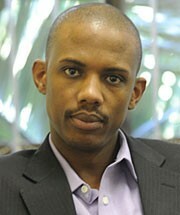 After gaining a number of years experience within the ICT sector, I started Rural Brands in 2008. With the growth of the ICT sector and the proliferation of the Internet, I was consistently inspired to create ideas which would provide solutions to make my own job easier. This is what motivated me to actually build products as opposed to purchasing them. I draw a lot of inspiration from the Silicon Valley Entrepreneurs and local pioneers such as Mark Shuttleworth, Vinny Lingham and Phuthuma Nhleko, who all have had great success in the ICT industry. What advice can you give to aspiring to entrepreneurs? Always be honest with yourself. There is a very fine line between being an Entrepreneur and a Dreamer. Most of us romanticise about the idea of being our own boss and the perks that come along with the title. This may result in overlooking the hard work, sacrifices and vast challenges that accompany the title. Not recognising these aspects from the beginning could result in failure. Be sure you have what it takes, take your time, make sure you are in it for the long haul and have fun! As entrepreneurs, we should realise that money comes as a by-product. Also, discipline, integrity and business ethics should take preference above reproach. Entrepreneurs should never lose those principals as they are priceless. Rural Brands is in the process of developing our own Enterprise Resource Planning tool, which we plan to launch in 2014. This will be a great accomplishment for the company. I also see the business growing steadily and offering employment opportunities to young South Africans within the technology sector who display talent. I believe that we have what it takes, and with the right motivation, the courage and the tenacity we have displayed thus far, we are getting there. We have erected a strong foundation and learnt from our mistakes. As a business we know where we are heading and we are carefully forging ahead, making our mark within the industry. What is your opinion on the reports of the Western Cape becoming the Silicon Valley of South Africa? I think it is a great idea and a great moral booster to most ‘tech geeks’, including myself. It will put us on the global ICT map and should also foster further innovation and job creation in the sector. Why did you decide to enter the Sanlam / Business Partners Entrepreneur of the Year® competition? I believe as an emerging entrepreneur I have much to offer. Apart from being a young and educated South African, I am also developing home-grown products and solutions that will hopefully highlight our country’s innovative talent. I believe that our country can compete internationally with places such Silicon Valley, which has become synonymous with technological innovation. Why would you recommend that fellow entrepreneurs get involved with initiatives such as Sanlam / Business Partners Entrepreneur of the Year®? You will never know if you or your products are making it, or whether they are relevant in the market, unless you benchmark yourself against your peers. This will not only allow you to learn from other individuals’ experiences, but also alert you to any shortcomings in your business or improvements that can be made.